I think I’m done with downtown destinations (though I reserve the right to revisit downtown at any time in the future). I should probably start to write up some of the parks that I’ve visited in the last few years. I guess I’ll start with the park that I visited on Saturday, April 23, Denman Estate Park. Gilbert M. Denman, Jr. was an attorney and philanthropist who lived in San Antonio. Denman donated many Egyptian, Greek, and Roman artifacts to the San Antonio Museum of Art (review to follow). When Denman died in 2004 at the age of 83, his only heirs were two cousins, and so the executors of his estate broke his real estate into two parcels and sold one to the City of San Antonio and the other (which contained the structures on the property) to the University of the Incarnate Word. The 12.52 acre parcel that belongs to the city has become Denman Estate Park. When you arrive at Denman Estate Park, the first thing you notice is Denman’s mansion. This is now owned by the University of the Incarnate Word and you can photograph it, but it is private property and there are signs saying that trespassers will be prosecuted. As you travel down the 0.36-mile path, there will be a labyrinth on your right-hand side. I like to walk the labyrinth when I visit. After the labyrinth, the path goes around a pond. 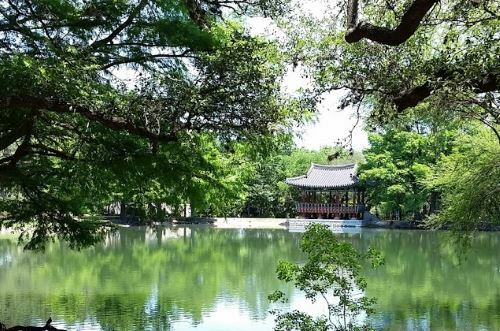 On the far side of the pond is a pavilion donated to the park by the city of Gwangju, South Korea. The pavilion was built in Korea and then disassembled, shipped to the United States, and reassembled by the artisans who built the pavilion. There are signs saying that people should stay off of the pavilion. A friend who works in the construction industry says that the pavilion was built with traditional methods. There is not a single nail in the whole thing. This means that it is probably not going to fall down if you go up in it, but it also doesn’t comply with San Antonio municipal building codes and thus is unfit for human occupancy in the city. Also, keeping people out of it will keep it looking as nice as it can for as long as it can. So just admire it from the ground and don’t go up in it. There is another branch of the path that passes down through a wooded area behind the pavilion. I think I’ve only been down that path once or twice, and it’s a very nice, shady walk. In front of the house is a statue of a mermaid labeled “AMA MARIA ” and with a set of coordinates. In Spanish, “Ama” is “he, she, or it loves,” so I assumed that the name is in Spanish. It isn’t. The statue is part of a charity art project to raise awareness of the state of the world’s oceans. The explanation for the “AMA” name is that this is the title used for female pearl divers in Japan and Korea. It looks like there are nine of them in existence, and the website tells how to purchase one, if you have €15,000 plus tax (and shipping if you live outside of Europe) burning a hole in your pocket. AMA Maria belongs to the University of the Incarnate Word, but she is on the park side of the house. I’m not sure if she’s on private property or not. Denman Estate Park is a nice little park to visit if you happen to be in the neighborhood or if you have half an hour or so to spare. The main path is labeled Level 1, so it is wheelchair accessible. The path behind the pavilion is unlabeled, but it seemed to be no higher than Level 2 to me. There are some waterfowl in the park. The Sebastapol geese seem to be the most aggressive of them, and I’ve never had them do more than hiss at me. If you happen to have any ornithophobes in your group, you may want to be cautious on your visit. This is not the first article in the issue, but I wanted to get it out of the way. My dad handed this issue to me and said, “This will prove to you that I’m right. Sugar is poison.” And, in fact, one of the scientists they quote in the article says so, in exactly those words. Then, they provide us with a graph showing how diabetes is increasing right next to a graph showing that sugar consumption is decreasing. Come on now, if Tyler Vigen can show a correlation between US Spending on science, space, and technology and suicides by hanging, strangulation, and suffocation, surely the folks at National Geographic can do better than that. As an aside, Vigen’s Spurious Correlations website is a great way to kill an hour or so. I have to admit that I came to this with a bias. An old friend who is an evolutionary biologist once explained how we’re eating a lot more food than we used to and, this is important, the calories in that food are now more bioavailable than the used to be. We eat more frozen dinners and restaurant food and Lunchables than we did decades ago. We also eat a lot less fiber, and really the more I read, the more I think that fiber is really kind of key here; fiber lowers “bad” cholesterol, effects hormone levels for the better, and increases insulin sensitivity. She explained that our ancestors probably went through something very much like our current obesity epidemic once we started cooking our food. Cooking breaks down the foods and makes, you guessed it, the calories more bioavailable. Her belief is that those whose genes could cope with the additional calories used those extra calories to build smarter brains capable of things like language and music and civil engineering. Cohen also tells us that people are eating less fat and are getting larger. If Americans really were eating that much leaner, wouldn’t McDonald’s now be a salad bar restaurant? It isn’t. They still serve deep-fried all sorts of things. The deli at my store used to sell roasted chicken legs. No more. Now, unless one of the few fresh salads available (and the last time I had one of those, it tasted like old refrigerator) or sliced meats and cheeses it’s deep-fried (I don’t eat much at the deli since they got rid of the roasted chicken legs). Taco Bell’s new thing is cheese, sour cream, and meat in a deep-fried shell. Meanwhile, my local salad bar place just closed. If you can’t tell, I’m not real persuaded that low-fat dieting is the culprit here. Oh, and I’m not a professional editor, but shouldn’t “not so sweet” be hyphenated? It’s a compound adjective modifying “story,” isn’t it? The 1889 World’s Fair had the Eiffel Tower. The 1893 World’s Fair had the Ferris Wheel. And the 1968 World’s Fair had the Tower of the Americas. The Tower of the Americas, getting on towards sunset, Christmas Day, 2015. Fireworks. Traditionally, the city’s official Fourth of July and New Year’s Eve fireworks display have been set off with the Tower as a backdrop. 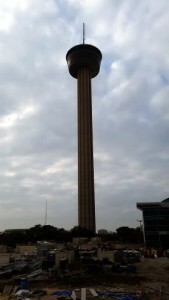 The annual Cystic Fibrosis Foundation Lonestar Tower Climb and Run. This is a one-mile run followed by a quick jog up the steps in the core of the Tower. Climbing the steps of the Tower sounds like fun. Running up the steps does not sound like fun. The rotating restaurant at the top of the Tower. For years the restaurant was operated by the same people who run the Jim’s restaurant chain. In 2004 the concession was taken over by Landry’s. Landry’s is a Texas chain of seafood restaurants that are nicer than casual dining, but not so fancy as what you normally think of when you think of a “fine dining” establishment. Traditionally, my family would go to the Landry’s that used to be on Riverside Drive* when we would go up to Austin to watch the bats at the Ann Richards/Congress Avenue Bridge. We could drop in in our jeans and t-shirts and not feel out-of-place. The Chart House Restaurant, the restaurant in the Tower, is fancy. Lots of tourists probably drop in in their jeans and t-shirts, and I’m sure they get fine service, but if you go, you probably want to wear your nicest jeans and a polo shirt instead, perhaps. The observation deck. This is what most people go up in the tower for. There are two levels — an interior section that had historic photographs showing what things used to look like in the direction where you are looking and an exterior level that has only plexiglass and wires separating you from the outside. It was very windy in the exterior observation deck the day we went. *This restaurant is, as of the time I’m writing this, a Joe’s Crab Shack. Hamill, who was 80 years old at the time he wrote this article, grew up in New York City. He explored it on foot and by subway through the decades, and in New New York, he looks back at the New York City of his youth and compares it to the New York City of today. To some extent, Hamill seems to be having a “hey, you kids, get out of my yard” moment, to the extent that they have yards in New York City. You know what I mean. One of Hamill’s chief complaints is that the old neighborhoods are going away, being replaced by high-rise apartment buildings. 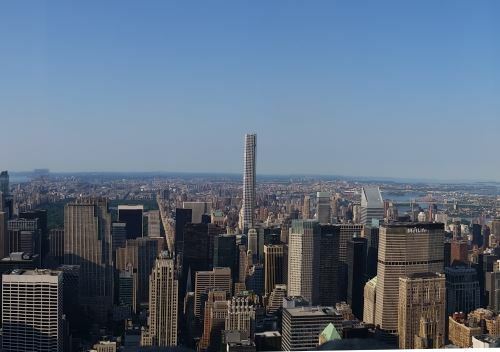 I have to admit that I share Hamill’s disdain for 432 Park Avenue, a big stick with windows a couple of blocks southwest of Central Park (see image). However, part of the loss of neighborhoods can be placed on the emphasis on suburbs in the United States over the last seventy years. Men who went off to fight in World War II came home and moved out of the cities into the suburbs, where instead of streetcars, they had automobiles and instead of neighborhoods, they had housing developments. Three generations (1946-1966, 1966-1986, and 1986-2006) have grown up living in separate boxes and traveling to jobs, schools, stores, churches, etc., in separate boxes. The cohesiveness of a neighborhood is foreign to them. And now, to get ahead in their jobs, they are moving into the cities and taking their isolation with them. 432 Park Avenue, taken from the Empire State Building, July 2015. You can see Central Park off there in the distance. Hopefully this isolation will only be temporary. Once they discover the joys of being able to walk where they need to go, neighborhoods will form again. Their children’s generation will be likely to connect, and reconnect, in both new and old ways. Perhaps the old neighborhoods will never return, but it will be interesting to see what this new generation of city dwellers will create. FotoKonbit is a project that allows Haitians to borrow cameras and photograph Haiti as they experience it. Too many people outside Haiti merely hear of strife, poverty, and natural disasters. FotoKonbit works with students both in the cities and in the rural areas to learn photographic skills and to show the outside world the beauty of Haiti as well. The text accompanying these photographs goes into the history of Haiti and also a bit of its future. You see, Haiti has billions of dollars of resources under its soil and someday people may come from outside to exploit them. This could be a benefit, if the companies extracting the wealth do it in a responsible manner and pay a fair price, or a disaster, if the companies follow business as usual and ruin the environment while cheating the Haitians out of what is fairly their own. We get a lot of lists of ships and ocean depths here. Also lists of the temperatures and salinity of the ocean at different locations. Really gripping stuff. Why are there no charts in this article? A few nautical charts or maps or something would have made this much more intelligible. At this point, Dyer seems pretty convinced that oceanic currents stem exclusively from wind; things like differentials in temperature and/or salinity didn’t figure into it at all, apparently. So, from a “so this is what things were like when people were just starting to science,” perspective, this article was pretty interesting. At this point, I can’t even. Really, the opening sentence says it all, In presenting to the National Geographic Society a summary of geographic advance as regards the domain of the air, the Vice-president finds a task somewhat difficult. I would think so, because, well, air. It moves, which is something that apparently the National Geographic Society was just figuring out in 1889. This list in this article is of meteorologists and what they’ve discovered, which was actually a bit more interesting than most of the lists in this issue. Still not a page-turner, but at least something to hold the interest for a while. Merriam admits upfront here that he cannot summarize what others have done this year in terms of the “geography of life,” because there have been no publications on the topic. So, he instead spends his nine paragraphs on what he believes the purpose of the Department of Life to be. This made article one of the few interesting parts of this issue, even if it’s a bit difficult to summarize. Merriam envisions making maps of where different species are to be found and then being able to create “natural faunal districts” from them. I wonder if he ever followed through on this plan. Next up, more December 2015 (we go to New York City next) and then, on my roughly-weekly walk on Monday, April 11, I will keep reading July 1889. I’m going to spend about an hour walking, so I doubt I’ll be able to make it through all of the rest of The Rivers and Valleys of Pennsylvania (I’ve tackled the first two of the five sections at this point), but I’ll give it my best shot.